WhoDaMan welcomes other wildlife enthusiasts to share their best shots! Congrats Billy Pasukinis with one heck of a bow kill that scored 166, 27! Brian got this bluefin tuna on Cape Cod. It was 55 inch and weighs 106 lbs. Great Job! Walters biggest red ever! Congrats! some fine shoot there George. "It might be an electrical engineer when it greaux's up, its already got some tape!!! Its been returned from whence it came... So neaux we didn't eat it, its too small!!! But we do have several recipes for when it gets bigger!!!" 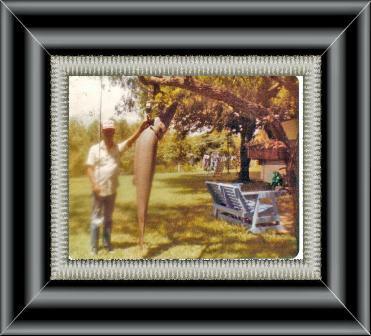 favorite surf rod off the shore of Lake Corpus Christi. Danny and Billy the "Dynamic Duo"
from OK tied for the "Ugliest Fish"
award on a recent Alaska fishing trip. 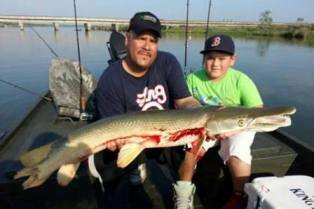 Louie and his son Jordans first alligator gar caught out of the Nueces River in Corpus Christi on the 4th of July. Great job guys! her biggest buck to date. Here is a picture of Craig holding an 80lb blue cat that he caught noodling. Craig still carries the scars where the big cat tried to chew his arm off....this would make most folks look for a different hobby but not Craig. Last time I saw him he was looking for a bigger catfish and didn't have a rod and reel either. Killed these two 1 is a jake about 1 ½ years and the other a full grown tom weighed about 25 lbs 1 in spurs and a 10 in beard there were 4 of us and we killed 6 turkeys 2 jakes and 4 toms( all with 9 ½-10 in beards ) they were all killed on a turkey hunting trip in Glasco, Kansas. Jody Oden killed this East Texas Canvasback drake...heck of a trophy ya got there Jody. Jason and Shannon (both Iraq war veterans) with a limit of redheads and a bonus teal from the Redneck Riviera. Here is a picture of "Wild Bill". 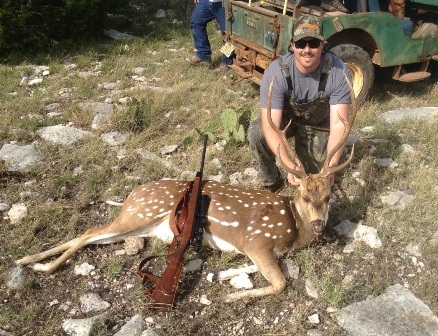 WhoDaMan meet him and his posse hunting mule deer is the most rugged spot in the Texas Panhandle. Wild Bill killed a whitetail and a mule deer on this hunt and showed me this buck that was killed a couple of years ago. I was told Wild Bill has God guide him through life and it sure helps during hunting season. God Is Good to those that follow him. A couple of nice bucks taken by Dannie Marie Garcia from ThreeRivers TX. Nailed that cotton tail @ 22yds with her Matthews Mission compound. First shot ever at a live target. A beautiful 168 B&C, 14pt whitetail, taken by Gary Arrington! Congratulations! Boar was 330lbs and was picked out by Squirt Da Wonder Dog. Squirt beat the rest of his pals to the boar which proceeeded to beat the snot out of all the other dogs, including the catch dogs, only Squirt could hang with the boar. Squirt is a jagterrier owned by bgoatcher@cox.net Joey is holding Squirt Da Wonder Dog. June 6, 2010 Anthony Zertuche Jr first Large Mouth Bass Catch, Choke Canyon State Park. is a WhoDaMan class catch if I ever saw one. Bigger The Crawfish The Bigger the Goo"
Calvin Marks, Ralph Marks and Gordon Rials put the hammer down on a bunch of sac-au-lait... when asked where they caught them they said "we caught them all in da mouth"
No they are not related to WhoDaMan...well we dont think so anyway. pheasants in the Texas panhandle. 5' 8" gar in the Nueces River June 20, 2009.
start out the year, way to go! 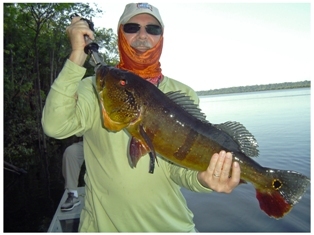 Attached is a picture of the 18#, 29"long, 18" girth Florida strain bass. I caught it on a 15' crappie buster rod with a cricket, split shot and small cork. 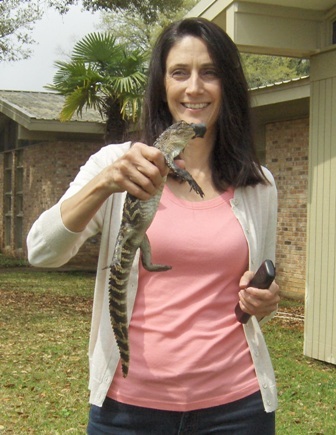 I caught it in a 5 acre private lake in east Texas. I was catching perch like crazy. I dropped my bait in the pond at the dam and it sounded like someone flushed a commode. She just rolled over and gave up. 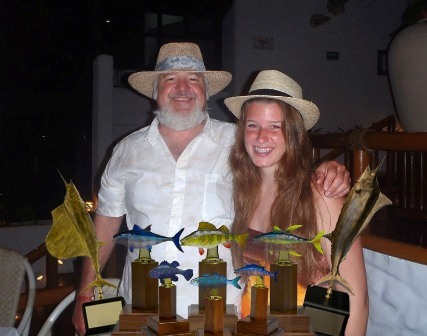 I will send another email with my 2 brothers and part of their catch from the day before I caught mine. Forwarded via email from our brothers in Iraq. Great shot! red snapper and mahi mahi. From our Canadian friends a super sized crawfish.